So apparently Spring didn't hear all our cries to come early this year. Last week it snowed in Tofino and Ucluelet...I was under the impression this never happened so needless to say I wasn't the most excited when I saw it on the ground. Luckily it melted quite quickly and all was well again. Last weekend Dave and I went back to Victoria to visit family and friends and when we arrived there was snow on the ground! I was not impressed. I don't know about you but I am getting sick of wearing the same warm sweaters on rotation in hopes to stay warm all day. However, that being said, I have noticed the days are getting longer and I am so glad about it. For the last few weeks of winter (I hope,) I will be wearing this outfit as a sort of uniform, switching up different elements of it. It can be hard to look stylish when it's so cold out but I think I have found a great way to do it. The key is a really great coat. Last year while we were in London my cousins bought me this beautiful wool Topshop coat that I have been wearing non-stop this winter (when it isn't raining or snowing!) It looks great paired with a simple outfit, like sneakers, a tee and jeans. 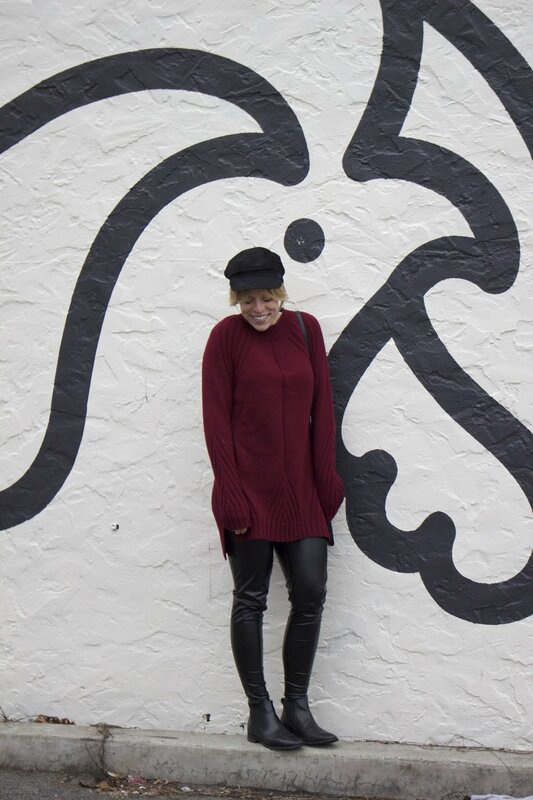 Here I paired it with my favourite accessory of the moment: the Baker Boy hat, a warm sweater dress and leather leggings. These leggings have been a savior in these cold months when tights are just not an option. They are really thick and really keep the heat in which is great on days where it's chilly, not so great if you run warm though. This coat will definitely be worn for the next month before I hopefully can pull out my lighter layers in hopes of spring weather! Do you have a winter uniform?